Green roofs, sometimes called rooftop gardens, consist of a layer of vegetation planted in a growing medium that in turn sits on a waterproof membrane, all on the surface of a flat roof. It may may also contain an additional layer or layers to address water drainage and irrigation, if the roof is designed to act primarily as an accessible park with trees, bushes, shrubs, walkways, and seating areas – such parks are known as intensive green roofs. Conversely, extensive green roofs are those that not designed to serve as accessible rooftop gardens and basically consist of hearty, low-maintenance ground cover. The green roofing requirement, or the percentage of available roof space that must be covered by the green roof, is determined by a graduated scale that ranges from 20% to 60% depending on the size of the building or structure. 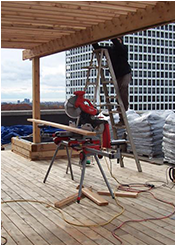 Whether the installation of green roofing is mandated for your building by the current City of Toronto by-law or you wish to add aesthetic and environmental appeal to an older structure, the complexity of the process would make the professional services of green roofs specialists, such as the team from Landcare, highly advisable. The green roofing services of the Landcare team consist of the design phase, on-site inspection/analysis, construction/installation, and maintenance. Much of this process is influenced and overseen by Rob Crysdale, Landcare’s owner and an accredited Green Roof Professional. To ensure the knowledgeable and experienced green roof installations in Toronto and the GTA, call the professionals at Landcare today at 416-410-0320 or contact us to gain more insight and to exchange ideas.